00:03 Dave Aizer: Welcome back to Inside South Florida. I’m Dave Azier. 00:06 Melissa Marrero: And I am Melissa Marrero. August is National Hair Loss Awareness Month and here with the latest and greatest options for men and women is Dr Alan Bauman. 00:15 Dave Aizer: Dr Bauman, good to see you. Welcome to our show. 00:17 Dr. Alan Bauman: Hey, thanks for having me, Dave. 00:18 Dave Aizer: It’s my pleasure. Let’s get right to it. Let’s talk about the various stages here of treatment. We’ll start with the least invasive, and talk us through it. 00:27 Dr. Alan Bauman: Sure. Most people will start with something like nutritionals or hair care to try to manage what’s going on with their thinning hair problem. Unfortunately, we have to get a little bit more on top of the problem. The evaluations that we do in the office can actually measure density and hair diameter. We have hair cameras, microscopic magnification to see exactly what’s going on with the density, so we know to take action. And, what can we do? We can start with prescription products, medications that we prescribe either topically or orally. We can use at-home laser therapy devices like the Capillus laser cap. 00:58 Dave Aizer: Yeah, this thing looks wild. Tell me about this. 01:00 Dr. Alan Bauman: Yeah, so Capillus laser cap is a brand new device. It’s six minutes per day at home. Drug-free, chemical free, zero side effects, with excellent hair regrowth. It’s not gonna regrow a dead follicle, but it’ll enhance the hair follicles that you have. 01:14 Dave Aizer: Okay, I’m glad you said that ’cause I wanna make sure I understand that, our viewers understand that, too. At what point do you have to do the surgery, do you have to do the transplantation, nothing else is gonna work? When do we reach that point? 01:26 Dr. Alan Bauman: The medical therapies like topical medications, oral medications, laser light, even PRP, platelet-rich plasma, that we do in the office, that’s to protect the hair follicles that you have and enhance those. But, if the follicles are dead and gone, you’re gonna need some kind of hair transplant. 01:41 Dave Aizer: You’re able to look at a follicle and determine if it’s still alive? 01:44 Dr. Alan Bauman: Well, when we look at the scalp, we can see, are the follicles miniaturized beyond repair, or are they missing or gone? And that’s how we’re gonna know. Like a receding hairline, for example. Those areas are gonna be beyond repair with just non-invasive treatments. We’re gonna have the hair transplant that. Like smart graft, like FUE technology, minimally invasive that leaves no scarring, no scalpel incision, no stitches or staples. We move the individual follicles one at a time from the back of the scalp into the thinning or the balding area. 02:10 Dave Aizer: That is wild. How long does that take? 02:12 Dr. Alan Bauman: It could take a long time. I mean, a procedure could take six to seven hours in the practice to restore a good-looking hairline. 02:19 Dave Aizer: And the person’s awake? 02:20 Dr. Alan Bauman: The person’s awake, but comfortable. Watching movies, they can get up and go to the restroom. We’re gonna feed them some snacks, but there’s not gonna be any discomfort there. It’s all under local anesthetic. 02:30 Dave Aizer: What’s the most dramatic thing that you’ve seen or done? Like in other words, how bald was somebody before they saw you? I know there are some great before and after photos and then after they left, they look like George Clooney. 02:42 Dr. Alan Bauman: Sure, so our typical patients are more like some of the before and afters that we sent over to you like Brian who had a smart graft procedure with us. But, my dad was totally bald before we transplanted him, so he needed three separate procedures to restore what looks like a full head of hair today. 02:56 Dave Aizer: That’s amazing because I was under the impression that if you were fully bald or mostly bald. If you had the George Costanza thing going on, there was no hope for you. 03:04 Dr. Alan Bauman: No, that’s not the case at all. 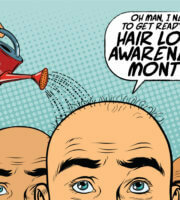 Most people have enough hair around the sides and the back of their scalp to redistribute. Those are the permanent hair follicles, so we’re gonna put those into the hairline, the frontal density, and recreate the coverage in the crown. 03:16 Dave Aizer: And how long does it take before you’re able to walk confidently out in the streets and feel good? 03:21 Dr. Alan Bauman: Yeah, so great question. Recovery is gonna be super comfortable. It’s gonna take about a week for the crusts to flake off of the scalp, and then you’re back to normal, maybe with a little shorter haircut, but you’re gonna be fine. Then, the hairs shut down and they start to kick in and grow at about six to 12 weeks. It’s gonna take about six months to see half of the results and the full result in a year. 03:39 Dave Aizer: That’s not bad at all. 03:40 Dr. Alan Bauman: Not bad, and it’s there permanent, so you never have to worry about it. The transplanted hair does not need any further treatment. It’s there forever. 03:47 Dave Aizer: Okay, well, this sounds great. If people wanna reach out to you, how do they find you? 03:50 Dr. Alan Bauman: They can call, click, or visit baumanmedical.com. 03:53 Dave Aizer: Great to see you, my friend, and this guy’s hair is so good, you have to trust him. Look at this head of hair. 03:57 Dave Aizer: So he did a hair exam on me. I’m good. However, there’s a little bit of miniaturization. 04:03 Melissa Marrero: Are you sure you’re good? It’s ’cause you push your hair forward. 04:07 Dave Aizer: No, I’m good. As far as… I’m good for now. 04:11 Melissa Marrero: Okay. All right. 04:28 Dr. Alan Bauman: Hey there, it’s Dr Alan Bauman. Don’t forget, you can start your hair loss consultation from anywhere in the world by visiting baumanmedical.com.